A woman with a child carries an empty container and water purification pills that came in the first aid shipment from the International Red Cross in Caracas, Venezuela, Tuesday, April 16, 2019. 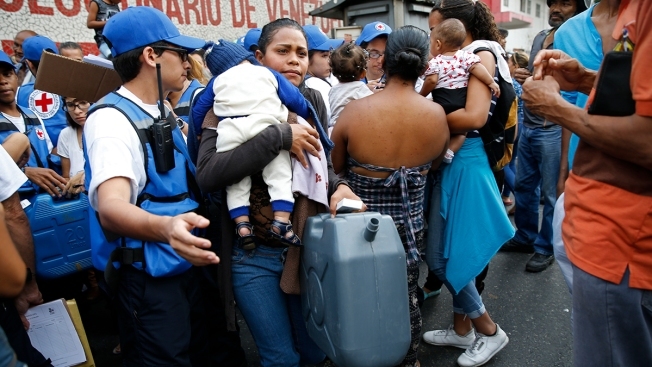 The first shipment of humanitarian aid from the Red Cross arrived in Venezuela on Tuesday, delivering medicine and supplies for needy patients in a country whose president has long denied the existence of a humanitarian crisis. Red Cross volunteers distributed the first shipment of badly needed emergency supplies in Venezuela on Tuesday after months of feuding between the government, which has denied the existence of a humanitarian crisis, and opponents who have been seeking to use the delivery of aid to force President Nicolás Maduro from power.